« Labour Representation Committee (LRC) Heads For Oblivion as it Backs ‘Labour Against the Witch-Hunt’. So the Anti-Fascists, I take it, are the the centrists, right in the daylight between leftist Stalin and far-right Hitler. Who, then, are the far-left? Is their platform the Communist Manifesto? And where would libertarians fit in if the European Anschluss were to permit them? Is a horizontal line all the dimensions one needs to properly depict political variety? Je n’y pige que dalle. Qu’est ce que vous voulez dire oiltransler. ‘Socialist’ is not a registered trademark either. So, in the 1920-1930s, real socialists would have lost court cases against Hitler’s party and its sister parties in other countries calling themselves ‘national socialist’,. However, though maybe not according to courts of law, real socialists were, and are, very right in calling the nazis fake socialists. 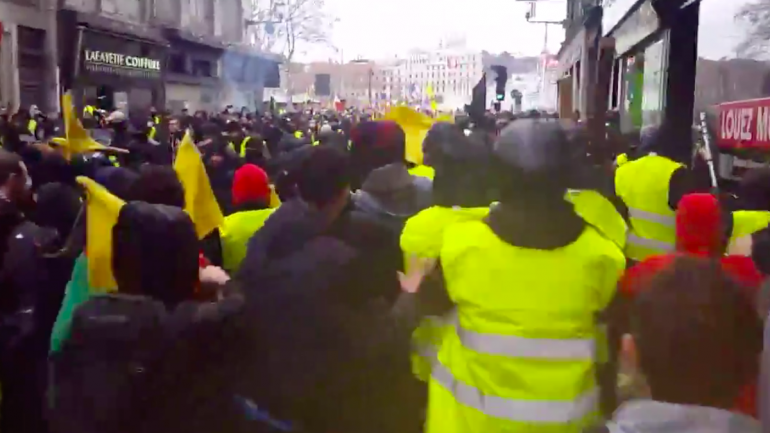 They should just leave the yellow vests in their cars. Only to be used in case of an automobile accident or breakdown. They are politically toxic now. Just been re-reading the excellent book ” Undercover” bu Paul Lewis and someone else whose name I can’t remember without going upstairs to get it. It is an excellent exposure of the Special Demonstration Squad which over the course of forty years put undercover policemen into left wing groups to the extent that in some cases they were running them. The squad was directly responsible for the violence at the BNP headquarters at Welling in South East London and it’s commander Bob Lambert actually incited two members of the Animal Liberation Front to firebomb London stores while he himself did the same to a Harrods In Harrow in North London. All of these groups are infiltrated and in some cases run by the state and that goes for the right as well as the left. I shall look out for that! Bob Lambert has a lot to answer for.